Northbrook, IL, March 19, 2019 – Digital Check now offers the SmartSource Pro Elite 75, a new high-speed check scanner that includes four-line inkjet endorsement capability. The new device – which boasts a rated speed of 75 documents per minute – increases throughput by 36 percent over the previous model, and also includes other general updates over the Pro Elite 55, which it replaces in the SmartSource scanner lineup. The Pro Elite 75 is available effective immediately. Also making its debut this week is a new variation of the SmartSource Elite 55, which adds a conventional USB model with a single-line inkjet endorser. Previously, the Elite 55 was only available in SE, or Serial Embedded, varieties. In these specialized models, the scanner has a built-in CPU and memory that runs key parts of the device’s API, thereby image capture and compression onboard the machine, rather than on a host PC. The new model offers the same base features in a non-SE version. 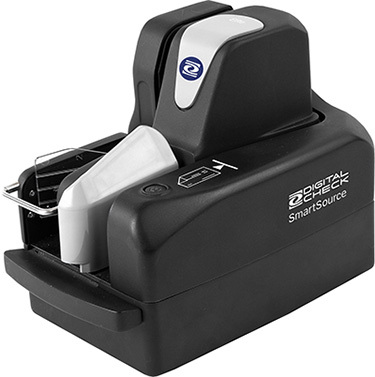 The newly introduced scanners retain all the best features of the SmartSource Elite series, including front and back ID card capture, automatic document detection and feeding, E13B and CMC7 MICR reading, optical character recognition (OCR), and selected 1D barcode reading capability. Both new models are backward-compatible with previous Pro Elite and Elite 55 devices, and run on the same API versions, meaning no additional software integration is required in most cases. For more information about the SmartSource Elite 55 or Pro Elite 75 models, please contact your Digital Check representative or visit www.digitalcheck.com. Digital Check is the leading worldwide provider of check scanners and peripherals for the banking industry. Our TellerScan®, CheXpress®, and SmartSource® lines of scanners provide the industry’s most reliable performance with superior MICR and image quality. Digital Check’s software delivers image enhancement and deposit-processing technologies that help clients thrive. Learn more at www.digitalcheck.com.